Finding apartments for rent in Littleton that have a community feel can be difficult. Similarly, finding luxury apartments that offer comfortable living spaces can be a challenge. Add in trying to find an apartment complex that is pet-friendly and you’re probably having a difficult time! The good news is that Summit Riverside Apartments, we proudly offer all three. Designed specifically for urban upscale living, we have a number of floor plans to choose from for 1- or 2-bedroom apartments. We even have apartments with loft spaces! In other words, no matter what you’re hoping to get out of an apartment, you’ll find it here. And, of course, we don’t mind if you’d like to share your living space with a furry friend or two! There’s nothing in life like having a four-legged friend. Studies have shown time and time again that having a pet brings with it a number of benefits to your health. Of course, that’s not the main reason to have a pet. It’s just that coming home to a ball of fur that’s excited to see you every day is one of life’s greatest joys. Unfortunately, many apartment complexes are not pet friendly, and it’s just not an option to get rid of your pup. At Summit Riverside Apartments, we know that feeling. That’s why we have a friendly pet policy. Yes, there are some breed restrictions, but generally speaking, if you have a pup or two, we’d love to provide you with your new place to live. We love the neighborhood that we’re located in and so will your pets. An on-site “Bark Park” is coming soon, but in the meantime, you can take advantage of the many nearby parks, natural areas, and dog parks in the area. If you’re willing to head out for an adventure, you can find plenty of sprawling trails to explore! Perhaps best of all, if you have a social animal, there are plenty of other furry friends in our apartment complex. There are even opportunities for your pets to meet other pets in the community thanks to our Barkday Paw-ties. In other words, there’s a lot for your pet to love here. As we mentioned above, there’s a lot to love as a pet owner as well, including the fact that we have enclosed balconies and patios to keep your pets safe. Between everything we mentioned above and the low pet rent, you’re sure to find a home at our friendly, pet-loving community. Be sure to contact us today to get the latest rates for pet deposits. 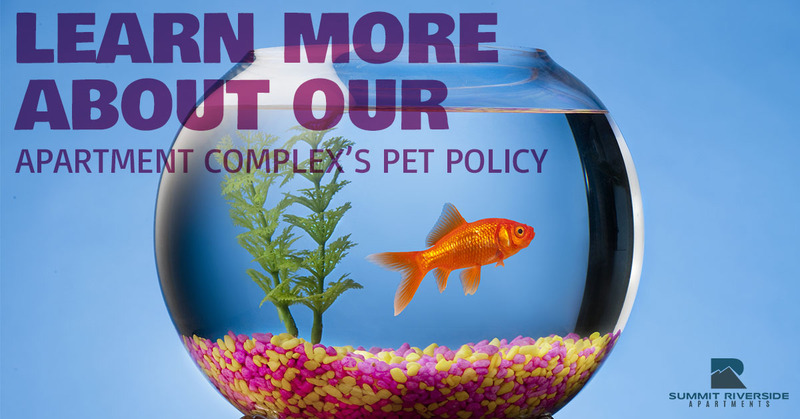 If living in a pet-friendly apartment complex sounds up your alley, we’d love to hear from you. We offer a number of floor plans, so whether you’re looking for a 1-bedroom apartment, a 2-bedroom apartment, or even an apartment with a loft space, we have you covered. We pride ourselves on offering luxury apartments with everything the modern apartment dweller could want. Be sure to check out our floor plans to see for yourself, or take a look at our list of amenities because you’re sure to find plenty to love between the 24-hour fitness center, playground, the central heating and air, the outdoor heated pool, and the wood-burning fireplaces. At Summit Riverside Apartments, we strive to be your go-to luxury apartment complex in Littleton, so if you’re looking for a new place to live, we’d love to show you around. Contact us today to request a tour! We really look forward to hearing from you.